When you first reach out to Bike Doctor Mobile, your first conversation will be with Scott Davis, Director of Franchise Sales. After introducing the concept and brand and learning a little bit about you and your goals, Scott will continue to be your personal liaison every step of the way as you navigate through the franchise discovery process. Scott is a graduate of the University of Maryland, College Park, and recently completed his MBA at Loyola University Maryland. He has been working in the real estate management industry for the past 13 years, but with grad school now complete, he finally has time to combine his passion for business with his passion for cycling. 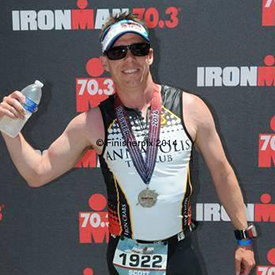 Scott is a competitive triathlete, focusing mainly on the international and half Ironman distances. He has served on the Annapolis Triathlon Club Board of Directors since 2013. Scott also competes in long distance open water swimming events, with his most recent achievement being the completion of the 4.4 Mile Great Chesapeake Bay Swim; one of the most challenging open water swims in the country. When you buy a new bike, getting professionally fit is the most important first step. Bike Doctor Mobile feels the same way about the franchise awarding process; the right fit between franchisee and franchisor is paramount above all else. Scott’s job is to not only assure that you are the right fit for Bike Doctor Mobile, but just as importantly, to assure that Bike Doctor Mobile is the right fit for you.